* Low power consumption, stable performance. Super small body, occupying less space. * The working mode can be changed by yourself: you can switch to Momentary, Latched dual modes as you need. "5 pcs" for 5 remote controls. 【Long Range】 Signal can pass through walls, floors and doors, steadily control receiver from any place within a reliable distance. Max range is up to 50m with no obstacle. 【4CH for More Control】Adjustable working way, control equipment turn/reverse, on/off. Switch Self-lock, Jog, Inter-lock. 【Easy to Use】Extremely easy to setup, learn, relearn and control(please refer to introduction). Stable and reliable performance, high receive sensitivity. 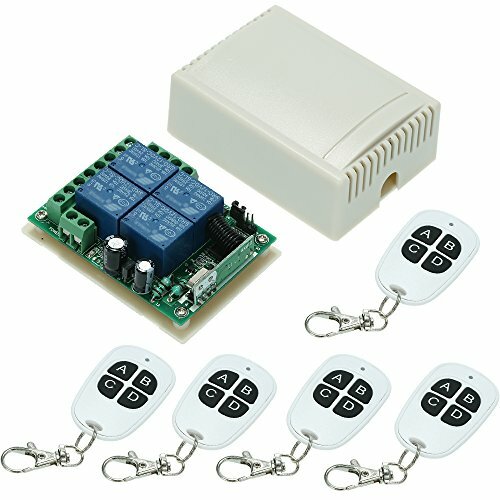 【Wide Application】Wireless switch can connect to the electronic control lock, intercom doorbell, garage door, light, electric curtain, household appliances, motor control, lifting equipment, security system, etc. So that it can remote unlock the door, close the light, open or close the curtain,etc.